After killing the young daughter of Sheriff Hartman, Jed Sawyer is wrenched from his overbearing but loving mother and put into a mental hospital, his name changed to Jackson to keep his identity hidden from her. Years later, Jackson escapes with three other inmates and take a young sympathetic nurse as a hostage. Jackson might be free but for how long? Can he and the others keep evading a vengeful sheriff Hartman, and will he ever be reunited with the Sawyer clan? Tobe Hooper's original Texas Chainsaw Massacre was such a seminal piece of work that every attempt to either revamp, sequelise or prequelise it has always paled in comparison. Leatherface is a pretty decent attempt if you sit back and enjoy the ride without thinking to hard about its destination. One thing that this film gets perfect is an element which has so far been missing from the whole saga, even the original - Verna Sawyer, the overbearing matriarch and full force of nature who leads the Sawyer clan. Lilli Taylor gives a great performance, making Verna someone to be fearful of at all times. It's her frustrated attempt to contact Jed at the asylum that is the catalyst to the escape, in which the inmates take their revenge against the violent and vindictive staff. While Lilli Taylor is the perfect matriarchal figure, Stephen Dorff is a great antagonist. The kid who murdered his daughter is now an adult, and therefore fair game in his eyes. He's not interested in a peaceful resolution, he just wants bloody vengeance. When one of the escaped inmates is cornered by the sheriff, it gets pretty ugly. The French directors of Leatherface are notorious thanks to their debut film, Inside, an incredibly tense, bloody and squirm-inducing film. This is the first time since that movie they have come close to those same levels of excess. There are some seriously icky scenes here, including a bit of necrophilia and a horrific scene where the three remaining escapees hide inside the rotting carcass of a cow! pretty sure that guy's hat in the bottom right corner is a blooper - this might have been a BTS pic! 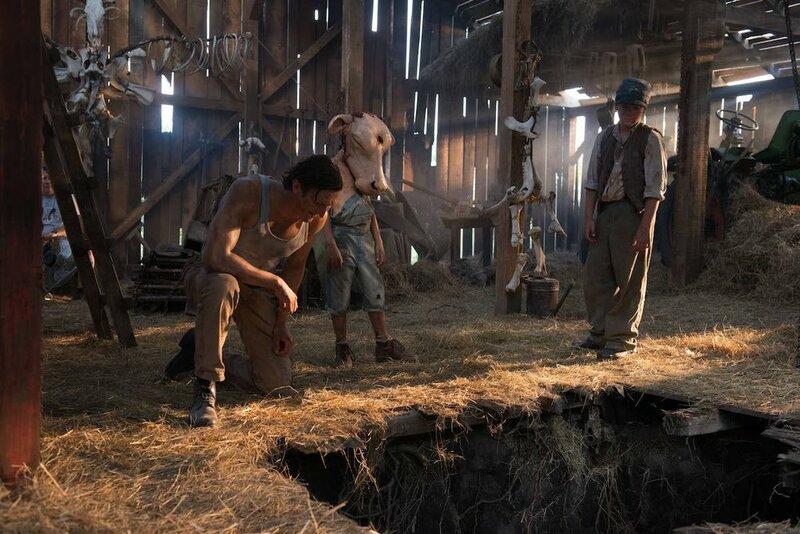 Where Leatherface falls down is in the desperate, illogical leap it takes to get Jackson to start to transform into the hulking, silent killer we know. Throughout the film, Jackson has been desperate to escape the violence that has dogged his life. He cries with frustration during the diner massacre. He' kind and sweet to Lizzie, the nurse they dragged along as a hostage. The events of the end of the film just do not make any sense when compared to what happened before. That doesn't stop it from being fun to watch, however. Leatherface boasts very good production values. It's well shot and provides some decent villains, likeable psychopaths and buckets of blood and guts. It just doesn't do enough to convince that this particular series of events would turn a guy into a hulking, chainsaw wielding maniac with excellent sewing skills.